And now for the VOA Learning English program, Words and Their Stories. When you work hard for your money, you do not want to lose it. And if you invest your hard-earned money, you want to see great returns. But if you're looking to invest money, be careful! We have an expression: If a deal is too to be true, it probably is. There are many ways to be tricked out of your money. There are frauds, schemes, scams and cons carried out by fraudsters, schemers, scammers and con artists. Two types of rip-offs that are good to know are pyramid schemes and Ponzi schemes. First, let's talk about pyramid schemes. It may sound like they started in ancient Egypt. But they did not. A pyramid scheme is a dishonest and usually illegal business in which the money of later investors is used to pay the people who invested first. The fraudsters behind a pyramid scheme make their marketing scheme look real with many types of products or services. However, pyramid schemers simply use money coming in from new investors to pay off early stage investors. When they can't raise enough money from new investors to pay earlier ones, the pyramid scheme falls apart. As it comes crashing down, many people can lose lots of money. A Ponzi scheme is similar, but also different. In both Ponzi and pyramid schemes, existing investors are paid by the money of new investors. But there is a big difference between a Ponzi and pyramid scheme. In a Ponzi scheme participants believe they are actually earning returns from their investment. In a pyramid scheme, participants are aware that they are earning money by finding new participants. They become part of the scheme. A Ponzi scheme is an investment trick. 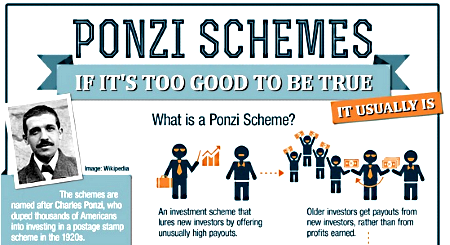 Ponzi scheme is named after Charles Ponzi. In the 1920s, Charles Ponzi tricked thousands of people into investing in a postage stamp scheme. At the time of his scheme, the annual interest rate for bank accounts was five percent. Ponzi promised investors a high return -- 50 percent -- in a very short amount of time. However, there were no investments. There were no honest returns. Ponzi used incoming funds from new investors to pay the returns to the earlier investors. A man named Bernie Madoff ran the largest and longest-running Ponzi scheme in the United States. The website BusinessInsider.com says Madoff made off with about $20 billion of investors' funds. One reason Madoff was able to fly under the radar for so long is because he was very well-known and trusted in the financial industry. He started his own investment firm in 1960 and helped start the Nasdaq stock market. But no matter how financially smart you are, a Ponzi scheme can only work if the clients keep their money in the scheme. Madoff's world came crashing down when his clients demanded to be paid about $7 billion and Madoff had only $200 - $300 million. In 2009, Madoff pleaded guilty to running a Ponzi scheme and stealing $17.5 billion from investors. He is serving a 150-year sentence in prison. But that is cold comfort to the thousands of investors, some of whom lost their entire life savings. So consider yourself warned! If an investment scheme sounds too good to be true, it is.